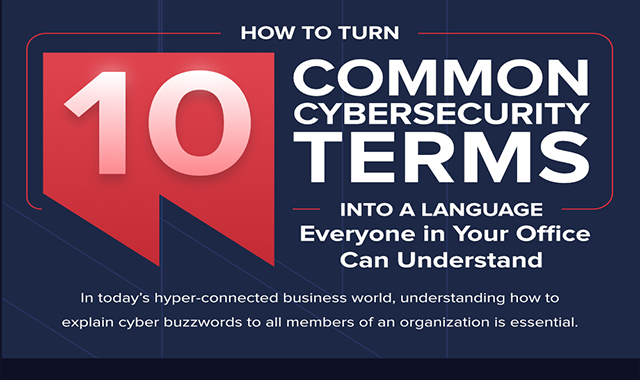 Turn Cybersecurity Jargon into a Language Everyone in Your Office Can Speak #infographic ~ Visualistan '+g+"
Explaining how cybersecurity affects an entire organization can be complex. The field is filled with jargon and buzzwords that can hinder understanding for those outside of IT. What’s more, everyone in an organization views cybersecurity through a different lens, depending on what their role in the company is. In order to explain important aspects of cybersecurity and how they affect your company, you must be able to communicate without using jargon that business stakeholders may not understand.